Arlington County's manager recommended the county board approve a contract for the Long Bridge Aquatics & Fitness Center and expansion of the Long Bridge Park. 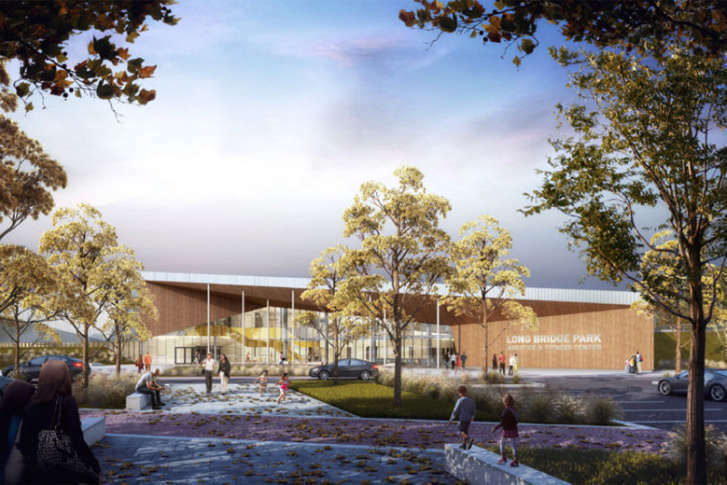 WASHINGTON — Arlington County, Virginia’s manager recommends the Arlington County Board award a $54.7 million design-build contract to Coakley & Williams Construction Inc. for the building of the Long Bridge Aquatics & Fitness Center and expansion of the Long Bridge Park. The new facility will include a 50-meter pool, a one-, three- and five-meter diving tower, a family pool, health and fitness spaces and an expansion of the park’s Esplanade, public spaces, parking and environmental remediation. “I think the community will be very pleased, possibly amazed, with the recommended design for the facility and park expansion,” said Arlington County Manager Mark Schwartz. It is the first time Arlington County has used a design-build approach for a new county facility, which establishes at budget at the beginning of the project that the contractor cannot exceed. Construction could start as early as July 2018. In addition to the construction contract, the county would set aside $5.3 million for cost overruns, bringing the total price for the project to $60 million. Long Bridge Park, north of Crystal City and adjacent to Interstate 395 is a 30-acre park that has three full-size, multisport fields. It hosts the County’s Fourth of July celebration every year, Marymount University soccer and lacrosse home games and other tournaments and events. The development of the park project has been in the making fore more than 10 years. The county had bids for the project back in 2013, but put them on hold because the costs turned out to be higher than expected.